Soffits are designed for proper roof ventilation. The ventilation in turn, reduces energy costs and amplifies the well being of your roof. It is very easy to maintain. It shields fascia wood from summer heat and winter cold. It also saves energy, while saving you money. It does this by keeping the house warm in the winter and cool in the summer. The Soffit gives the exterior of the home definition and beauty. Other uses for this structural element is that it keeps animals out of your roof or attic, while it also keeps mold and mildew away from it. 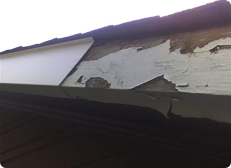 If youï¿½re tired of painting the damaged wood under your roof let us install Soffit and fascia, so you will never have to paint again. 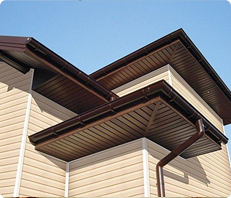 Our Soffit and fascia is weather resistant. It wonï¿½t rot, dent or split. It covers all the protrusions and roof edges to intensify the beauty of your home. So donï¿½t bother with trying to paint this dangerous portion of your home by yourself. And please donï¿½t spend hundreds by getting these areas painted every year or so. Let us install vinyl Soffit and aluminum trim for your home, to save you from periodical expenses and heavy-duty maintenance. Copyright Â© 2010 MR.FIX IT. All rights reserved.